The Galleria Vittorio Emanuele is at the heart of Milan and is a must see for all tourists. Not only is it one of the oldest glass covered galleries in Europe, but it is also a central meeting point and luxury shopping gallery. Inside you will find luxury boutiques such as the original Prada store, Gucci, Louis Vuitton, as well as luxury hotels like , specialty shops like Church’s English Shoes, Bernasconi Argenteria,and Borsalino . The most luxurious hotels are here in the gallery, the Hotel TownHouse 8 and Park Hyatt Milan. See below for a list of featured shops in Galleria Vittorio Emanuele. A walk through Milan’s historical center will take you past some of the most famous architectural structures of Europe. For example, starting from the city center, Piazza del Duomo, which is in itself an architectural wonder, you will be in walking distance from the Galleria Vittorio Emanuele, Teatro dell Scala opera house, San Lorenzo Maggiore, and the Torre Velasca. 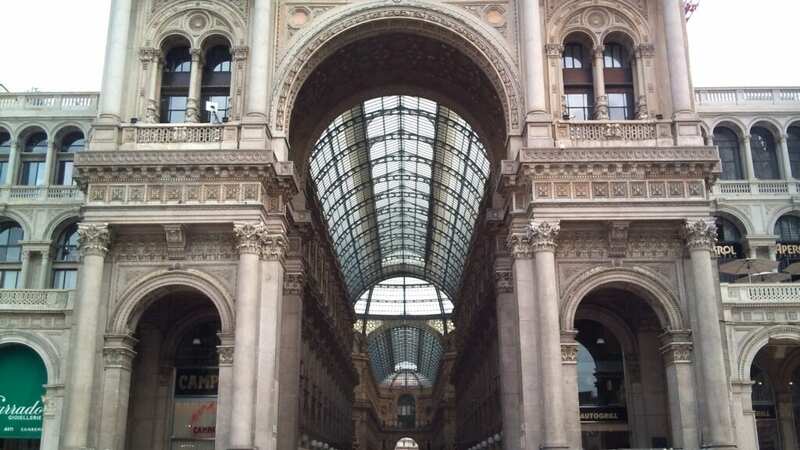 Galeria Vittorio Emanuele is one of the most beautiful covered galleries in Europe. Began in 1865, it was the first of it’s kind to make use of an iron and glass structure. In 1867, Giuseppe Mengoni, the architect, fell to his death from the heights of the glass dome while scrutinizing decorative details two days before King Vittorio Emanuele led the opening ceremony. Galleria Vittorio Emanuele was built not only to connect the squares of La Scala and Il Duomo, but to represent the union of church and state which came about after the nationalist revolution of 1848.